1Preheat the oven to 425°. Put the sugar and butter into a heavy cast iron skillet with a squeeze of lemon and cook over medium-high heat for about 5 minutes, stirring until it turns deep golden. Remove from the heat. 2To fan the pears, place core-side down on a cutting board and cut into 4 lengthwise slices, leaving the pointy end attached. Arrange cut side up in the pan, fanning them slightly, and placing them close together (fruit shrinks as it cooks). 3Roll the pastry out until it's about as big (or a little bigger) than the skillet; cover the pears and tuck the edge in around them. Cut a few slits in the top and bake for 20-25 minutes, until golden. 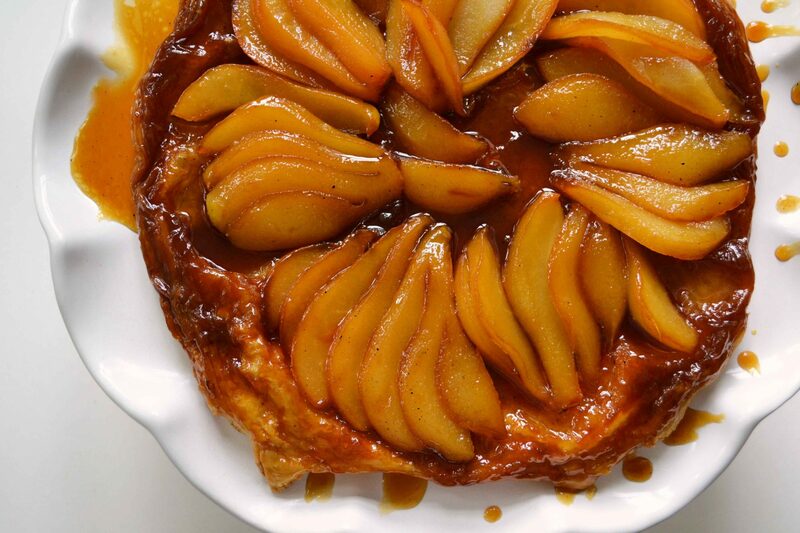 4Carefully invert the tarte tatin onto a plate while it's still warm.